I, too, saw cables on the downgrade where traffic coming out of Bremerton meets the remaining lane of southbound traffic on Highway 3, though I thought there were only three. I can’t be sure Ed and I are talking about the same spot in that interchange. There were cables across the through lanes and one on the off-ramp to go into Bremerton, too. I wondered if the state was comparing traffic counts coming out of Bremerton and on Highway 3 coming south, a notorious backup scene on weekday afternoons. They’ve said no to suggestions about revising the alignment there in the past, but I wondered if they were rethinking. The out basket: No, says Steve Bennett, traffic operations engineer for the Olympic Region of state highways. The tubes are counting traffic in preparation for reinforcement safety work on the rocky cliffs near Windy Point between there and Gorst the summer of 2011. The work, to include rock bolting and installment of mesh screens, will require lane closures. As for why there are different numbers of tubes stretched across the traffic lanes in these counts, Steve says, “We use two tubes (near one another) on highways, typically, for two reasons. “The first is when we have two lanes going the same direction, as we do on (Highway) 3, and we want individual lane counts. “The first tube stretches across both lanes while the second stretches across just the near lane. From this, the tube that crosses both lanes gives us the total count for the highway and the other tube gives us the count for the near lane, thus enabling us to know the counts for each lane. “It is done this way to minimize the amount of time personnel have to work in the middle of the highway. “The second reason there may be two tubes on a roadway is redundancy,” he said. “On high speed/high volume roadways, tubes tend to become damaged and/or non-working at a higher rate than on lower speed/lower volume roads. He also said there are only two tubes on that downgrade where Highway 304 joins Highway 3. That certainly was true on Feb. 23 when I went back and looked. Either I was mistaken in what I thought I saw earlier or it was changed. Since then, both tunes for southbound Highway 304 have been moved back closer to Bremerton. When I asked if multiple cables also can record vehicle speeds and the number of axles, Steve said yes. And when I asked why there are two tubes on the downgrade, but only one on the corresponding off-ramp on the other side of the highway, for traffic heading into Bremerton, it turns out there is one more reason for variety in the number of tubes deployed. After putting out the tubes on the on-ramp and the mainline in both directions, Steve said, they only had one left. What’s eating at Silverdale Way near Carlton Street? The in basket: Larry Guidici writes, “I drive through Silverdale regularly. What is going on under the surface of Silverdale Way adjacent to the tractor store? The out basket: The roughness resulted from a water main break on Nov. 7, says Eric Pickard of the Silverdale Water District. Since then, the water district has been making intermittent repairs when the surface gets too bad, as directed by Kitsap County, Eric says. The patch that stretches across the road near Carlton Street, done Feb. 10, was the most recent work. They will permanently repair it next summer. They will be replacing a number of water mains installed in the 1940s between Anderson Hill Road and Lowell Street, then give about 70 feet of Silverdale Way a finished paving across all four or five lanes. Eric says he expects that to happen in June or July. Incidentally, the water main break could have done a lot more damage had not water district Maintenance Manager Tim Knapp happened past the spot just after water from the break surfaced that Saturday night and called in repair crews immediately. A major sink hole might have developed had the problem gone unnoticed for a couple hours, Eric said. 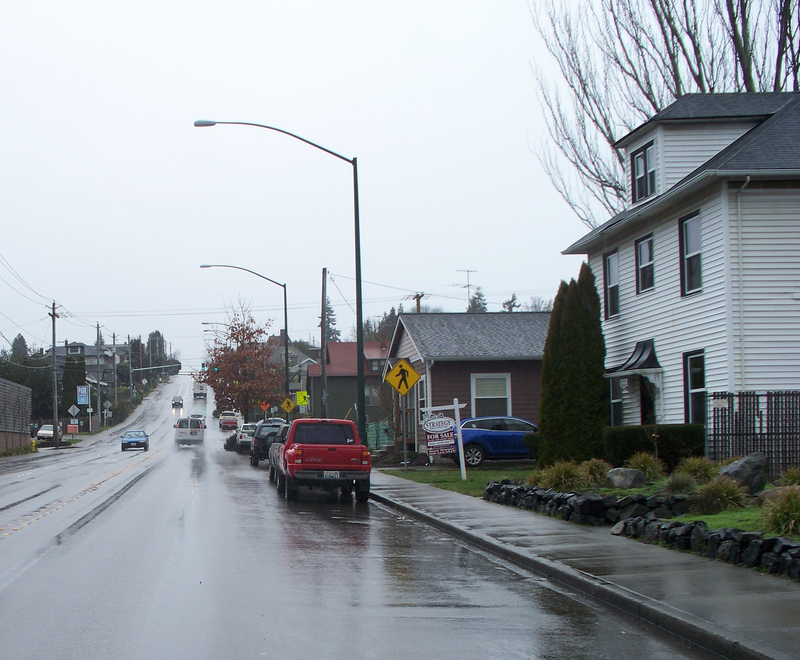 The in basket: Dennis Van Ieperen, one of those who crosses Burwell Street many days on his way to work at Naval Base Bremerton said the next intersection east of State Street, where a traffic signal has just been installed for pedestrian safety, needs some revisions. A Navy person was hit and badly hurt there this winter, he noted. It’s the Chester Avenue intersection. Visibility of pedestrians is reduced there by a tree and shrubbery that fill what is called a bulb-out, a widening of the sidewalk that lessens the distance to cross the street, he said. Worsening the situation is the position of the street light right above the tree and the fact the pedestrian warning sign on that side of Burwell is farther back from the street edge that its counterpart for westbound traffic. “You are supposed to detect a pedestrian in the dark behind the bushes and that tree,” he said. “Why is it still there?”. that can be seen from a reasonable distance. Colen included the accompanying photo to support his position. 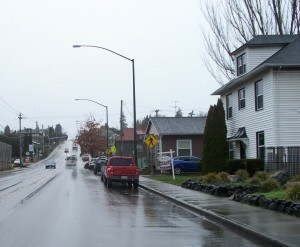 The in basket: Rod DeGuzman of Silverdale asks, “Can you please explain to me while the speed limit in Auto Center Way is posted at 25 mph (and not) 35 mph since this street looks like a commercial zone vice a residential road. The out basket: The lower speed limit on Bremerton’s Auto Center Way has never seemed odd to me, given all its hills and curves, including the combination of both where a lot of not yet licensed drivers come and go from the state Department of Licensing office. Ridgetop Boulevard, a county road, has a wide median to separate directions of travel and has better sight distances. The in basket: Rob Shafer of Port Orchard says in an e-mail, “In the past six months there have been three serious accidents, with at least one fatality, on Southworth Drive between Locker Road and Banner Road southeast of Port Orchard. “There is a slight turn to the left as you approach Curley Creek after Locker Road that all three drivers involved in the accidents missed,” he said. “At this point in the road there is very little shoulder and a BIG hole that either stops the car very quickly, or launches it back onto the road. The out basket: It looked to me that just filling the hole would correct whatever hazard exists. But the county plans more. Jeff Shea, county transportation engineer, says, “A guard rail in itself can be an obstacle near the roadway and is usually a last resort used to protect motorists from other roadside obstacles. That’s not the only work planned there, incidentally. The county has plans for a $2.1 million replacement of the bridge over Curley Creek just a few feet east of there next year, though the work isn’t likely to reach to the spot Ron mentions.